The Days of Johann, an agility dog! : Happy Turkey Day! Happy Turkey Day my pals! Remember our trip and hike at Fort Mountain a few weeks back with our best buds Rocco and his Mom from To Dog With Love? Driving on the way over we turned a corner and whoa! Brake Mum! There's a wild turkey in the road! Mum yelled to Rocco's Mom, camera! Take a photo, quick! Luckily Rocco's Mum had her camera in her lap as Mum was driving, so Mum slowed way down and she got a quick pic of the turkey, look at that! 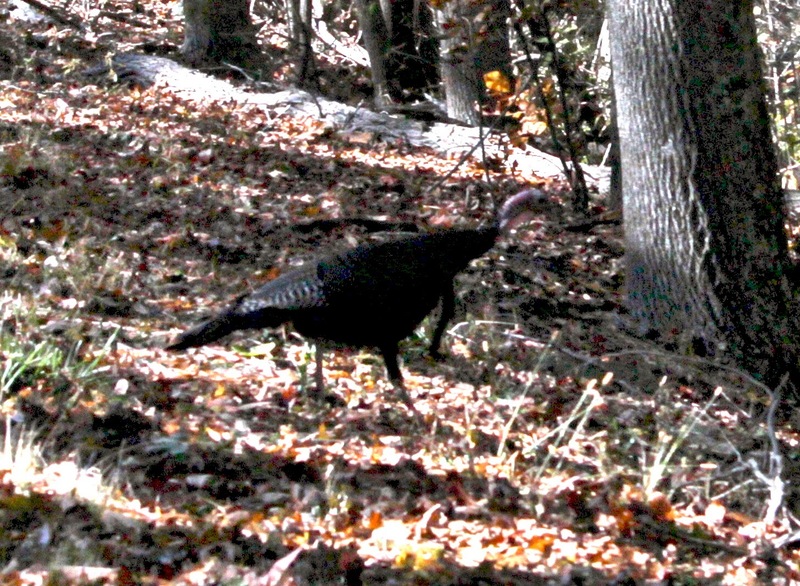 We've seen a lot of wild turkeys on our hikes throughout the two or so years here in GA, but they are quick little buggars and we've never been able to get a photo, but we have one now thanks to Rocco's Mom. Cool huh!?! We are very thankful today that we've got lots of electricity going in our cabin, that we've got great heat as it's super cold for this area this time of year. We woke up to a little snow yesterday and 22 degrees. This morning it's 15 and uber cold! We're also thankful for all of you who visit our blog, thanks for being our pals, my pals! Happy Thanksgiving! Pssstttt...shameless plug. Don't miss our post for all the great Black Friday/Cyber Monday deals we're digging out for you on our deal post, K? Great shopping, great deals from great companies we love! And for our international pals, we've got a great deal too! Happy Thanksgiving, Johann and Gracie! Stay warm today! 15 degrees is cold! Having electricity is definitely a nice thing hahah. Thanks for hopping on to the Thanksgiving edition of This 'N That Thursday! Hope you have lots of goods this holiday!